Chicago-based collective MAS Studio used off-the-shelf materials to build an artificial landscape in a disused lot in the city’s Little Village district. 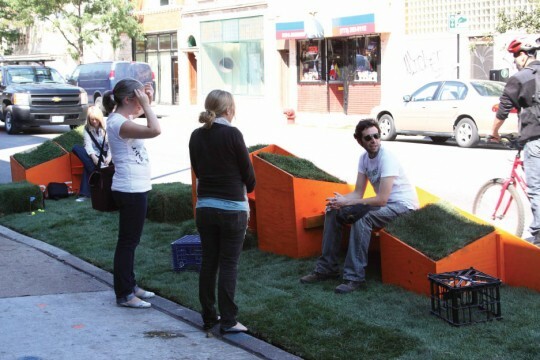 Plywood framework served multiple uses: benches, recycling containers, graphic signage, and planting beds for grass, flowers, and herbs. The project was built with community participation and changed how residents perceive their neighborhood. The team created simple instructions to accompany the design and made them available online so that a wider audience may construct their own pop-up planter/bench/park. Awarded first prize in the 2010 Architecture for Humanity Chicago Street Furniture competition, the project’s ultimate success is that city of Chicago recognized the impact of Cut.Join.Play and donated $100,000 to turn the former parking lot into an official park.